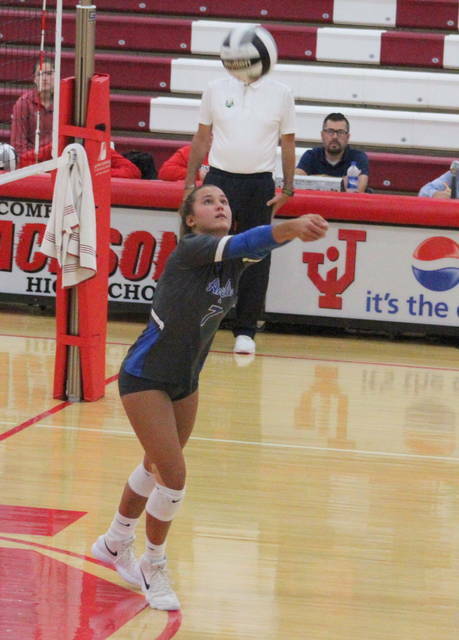 Gallia Academy senior Aubrey Unroe, right, hits a spike attempt during Game 3 of Monday night’s volleyball match against Jackson in Jackson, Ohio. JACKSON, Ohio — The kind of streak that never gets old. 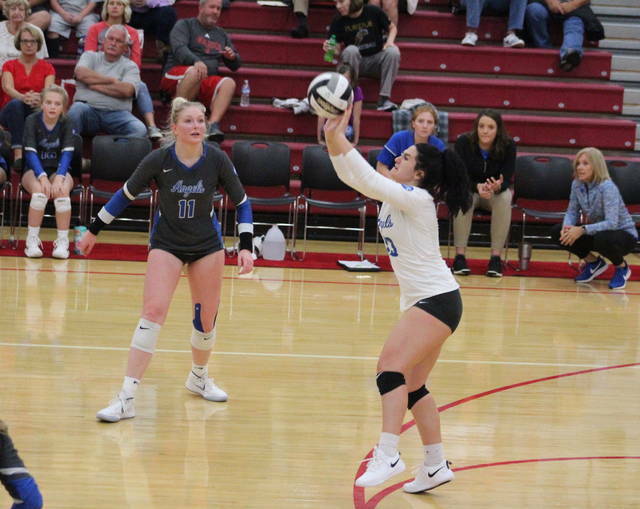 The Gallia Academy volleyball team remained unbeaten and secured its ninth consecutive victory over host Jackson on Monday night during a 25-15, 25-14, 25-14 decision in a non-conference matchup in the Apple City. The visiting Blue Angels (9-0) trailed in each of the three games, but the Ironladies never led by more than two points over the course of the straight-game outcome. GAHS, conversely, never trailed any later than 7-5 in Game 2 and ultimately won all three contests by double-digit margins. The Blue and White trailed 1-0 in the opener, but broke away from a two-all tie by going on a 15-8 run that led to a 17-10 edge. The guests opened the lead out to 23-13 before trading points the rest of the way for a 10-point triumph and a 1-0 match advantage. 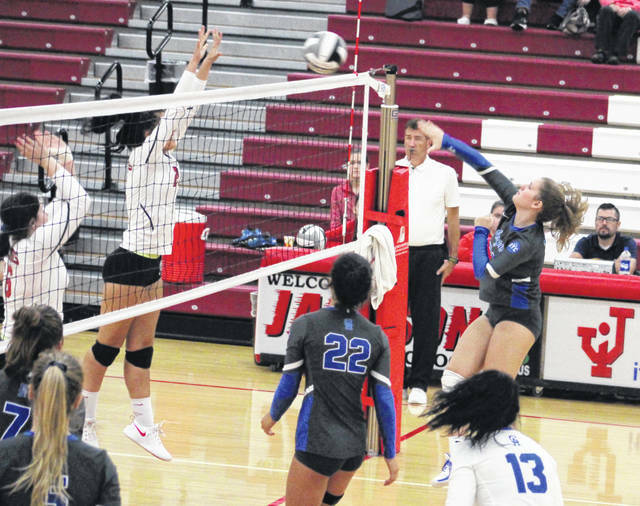 JHS took early leads of 5-3 and 7-5 in Game 2, but the hosts rallied with a 5-3 run to knot things up before scoring another six straight points for a 16-10 lead. The Red and White rallied to close within 19-14, but the Blue Angels countered with the final six points to wrap up an 11-point win and a 2-0 match edge. The Ironladies scored three straight points to take their only lead of Game 3 at 3-2, but the guests answered with seven consecutive points while establishing a 10-3 cushion. The hosts managed to close to within 10-6 and 13-8, but Gallia Academy reeled off eight of the next dozen points en route to a 21-12 edge. GAHS ended things with a 4-2 spurt, ending the 11-point outcome and the 3-0 outcome. Jackson last defeated the Blue Angels on Oct. 11, 2012, by a 3-2 margin. Gallia Academy — currently the 13th ranked team in the Division II coaches poll — has also won 16 of the last 17 outings between these two programs. Alex Barnes led the GAHS service attack with 16 points, followed by Ashton Webb with 11 points and Hunter Copley with eight points. Taylor Burnette was next with seven points, while Maddie Wright and Peri Martin respectively added three and two points. Webb had a team-high five aces and Barnes chipped in three aces. Burnette and Wright also had two aces and an ace in the victory. Webb led the net attack with 18 kills, followed by Barnes with 10 kills and Wright with seven kills. Maddy Petro contributed five kills, while Martin and Aubrey Unroe each added two kills. Martin handed out 41 assists on the 44 team kills by the Blue Angels. Webb led the defense with 10 digs and Burnette was right behind with nine digs. Reaghann Folden paced the Jackson service attack with seven points, followed by Gracie Walburn with four points and Halle Hughes with two points . Abbey Munn, Kylee Bako and Holley Sexton also had a point apiece in the loss. Munn led the net attack with two kills, a block and four block assists. Folden, Bako and Sexton also had a kill each. 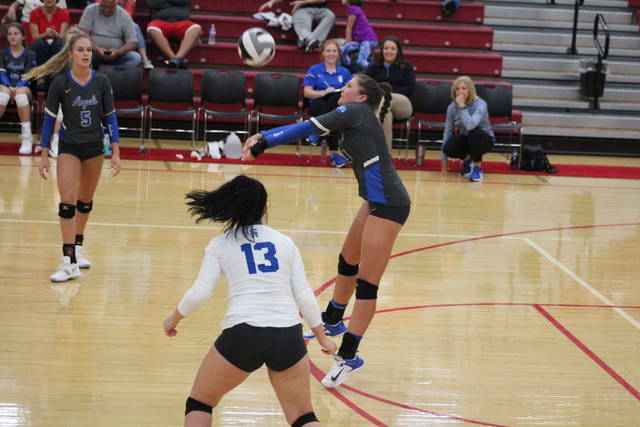 Walburn handed out all five assists, while Emma Stroth led the defense with nine digs. Gallia Academy hosted Meigs on Tuesday and returns to action Thursday when it welcomes Rock Hill for an OVC contest at approximately 6:30 p.m.